OK. So I need to rev up my calorie burning to lose the weight that has been sneaking back on since I started working in a very sedentary type job again (I miss the flexibility of home…). I don’t eat on my lunch hour because I snack on fruits, veggies, salads and nuts all throughout the day instead. So I have a half hour to kill at lunch everyday. How about I start running at work? Oh wait. I don’t really have a pair of running shoes. So I went and got some. I also bought a nice running jacket so that I wouldn’t be freezing my arse off on the chilly days. Now I need a place to store that stuff. I have been keeping that mesh for a long time and finally found a good use for it. 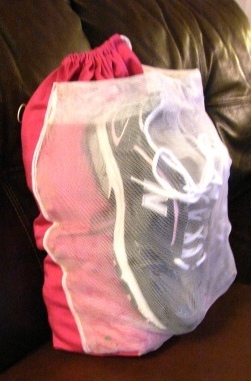 The mesh will keep my shoes airing out so that they don’t get all of my stuff stinky. 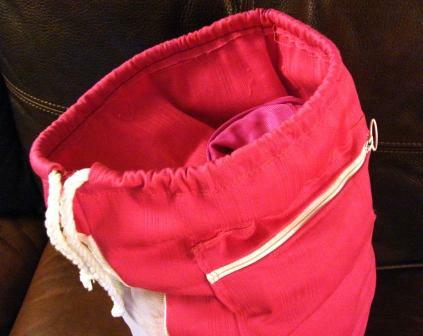 There is also a smaller pocket for my hair elastic, headband and deodorant. I have a towel wrapped in there for wiping myself off a bit (if needed) and for drying off my shoes (if needed). And I also worked up a sweat on the elliptical and trampoline. I’ll wrap up with some core exercises for my flabby mid-section, have a hot shower and head off to bed. Tomorrow we are hoping to burn up the tennis courts a bit. Weather permitting. We do live in Canada after all. We haven’t played since it started snowing and now that the snow is almost all gone we are ready for some racquet action. I need to get my racquet re-gripped this year. I am wondering if I would do a good enough job if I did it myself.